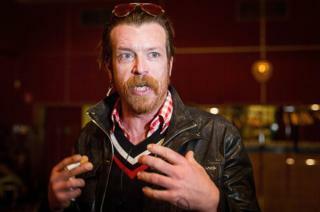 Eagles of Death Metal frontman Jesse Hughes, who survived the 2015 Paris attacks, has lashed out at survivors of the Parkland, Florida, school massacre. In a series of posts on Instagram, the singer labelled students who led the March for Our Lives protest on Saturday as "vile abusers of the dead". Hughes also accused one of the students of "treason" and mocked their gun control campaign. It is not the first time he has created controversy since the Paris attacks. In a series of four now-deleted posts on Sunday, Hughes said enacting gun control laws would "denigrate the memory and curse ourselves by exploiting the death of 16 of our fellow students for a few Facebook likes and some media attention". He appeared confused about the death toll, as 17 people died in last month's attack at Marjory Stoneman Douglas High School student.